Now all the little details about the event. When is this wonderful event? Showcasing how we can dress modestly and fashionable in the Autumn weather. 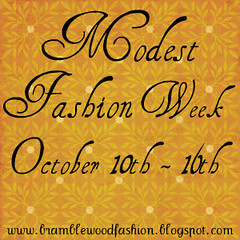 By posting photos of your outfits on your blog and linking them up here on Bramblewood Fashion daily. Besides keeping modesty and Fall weather in mind, the choices are endless and completely up to you. Be yourself and have fun! I only have one rue. Make sure your outfit is modest and pleasing in God's eyes. If I find your outfit entry to be objective or suggestive I have the right to remove your link. Spread the word! Tell your friends and try to get them involved in this week. I have a HTML button for you all to use below, to help spread the word. Just copy and paste the HTML code. If you have any questions let me know. I will try to get back with you. LOL! Gosh thats so exciting! 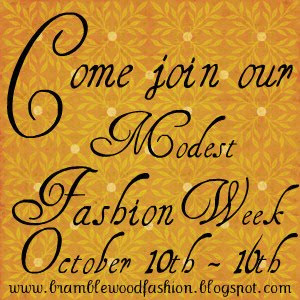 There is sooo many modest fashion weeks popping up! I think they're straight for Oct! I ALMOST picked Oct for mine too! But then I thought Jan. would be a good month since its "boring"
Just wondering... could I enter just once or twice, or does that ruin the point? I don't know if I could do the whole week but I'd like to participate! Celine, sure you can post only once, or twice. =) What ever works for your schedule that week. Sounds exciting! And I have been expanding my skirt collection as well! In fact, I was thinking of joining something like this during the fall/winter months, so this is perfect! I am definitely looking forward to it, but will have to talk with my mother about it first! This is such a beautiful idea!! I have a heart for modesty and femininity. I host a weekly meme called feminine Friday and I love to show how modesty can be done today. I will definitely be therewith bells on. I'm glad you found my blog. I love yours too! Exciting! Can't wait to see what y'all cook up! These are fun and I'm SO glad they don't require costumes as those of us where money is an issue cannot do the costume ones.